Custom ski builder Seneca Skis asked for a website, but copped to bigger challenges. For one, the ski market twisted the definition of “custom”, confusing Seneca’s customers. Seneca felt hazy on who their customer would be as they expanded. Speaking of expanding, the custom ski crafter wanted to evolve, but not “sell out”. Go inside skiers’ heads. This would reveal who Seneca’s most likely targets would be, and how best to connect with them. We pulled in longtime CI co-conspirators Kira Stoops (Flying Bicycle Creative) and Jen Cox (Aldea Marketing) to personally interview skiers, then use their beta to direct efforts, long term. Working toward what skiers wanted, Kira outlined an authentic brand guide, Jen drafted a grassroots-feel marketing strategy, and Molly designed a retro-surf-vibe visual style. 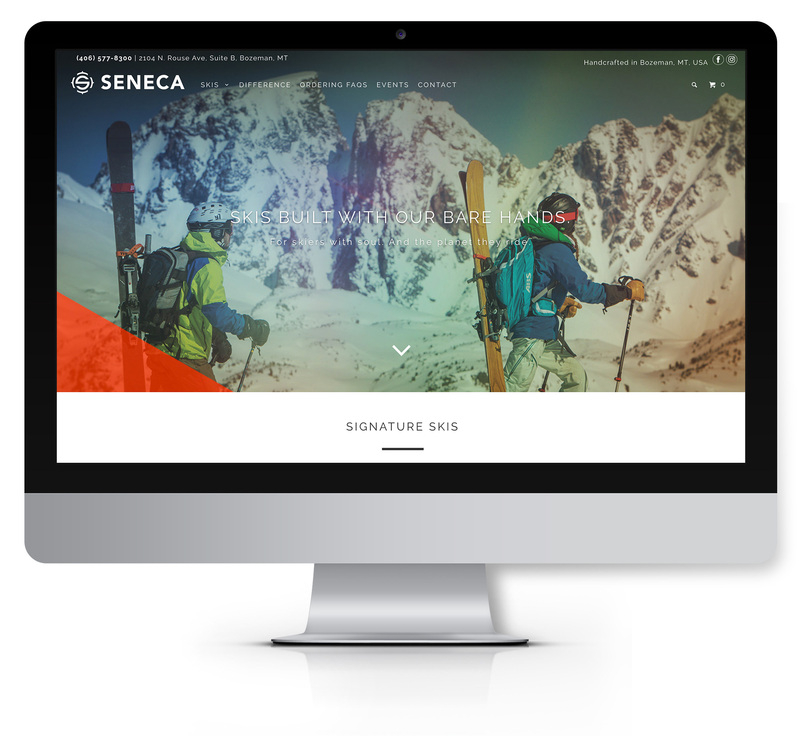 From radio mentions to social media to a sales brochure to the website itself, we educated skiers about what made Seneca special without nerding out on ski technology (a common gripe). We also tapped social media expert Chieko Horn to revive and maintain Seneca’s social outlets, giving them a direct line to skiers. Seneca could make more money and grow without selling their soul. A clear differentiation based on what skiers sought justified the company’s value, while frank storytelling and a grittier marketing strategy incorporating candid social media kept the ski builder down-to-earth. 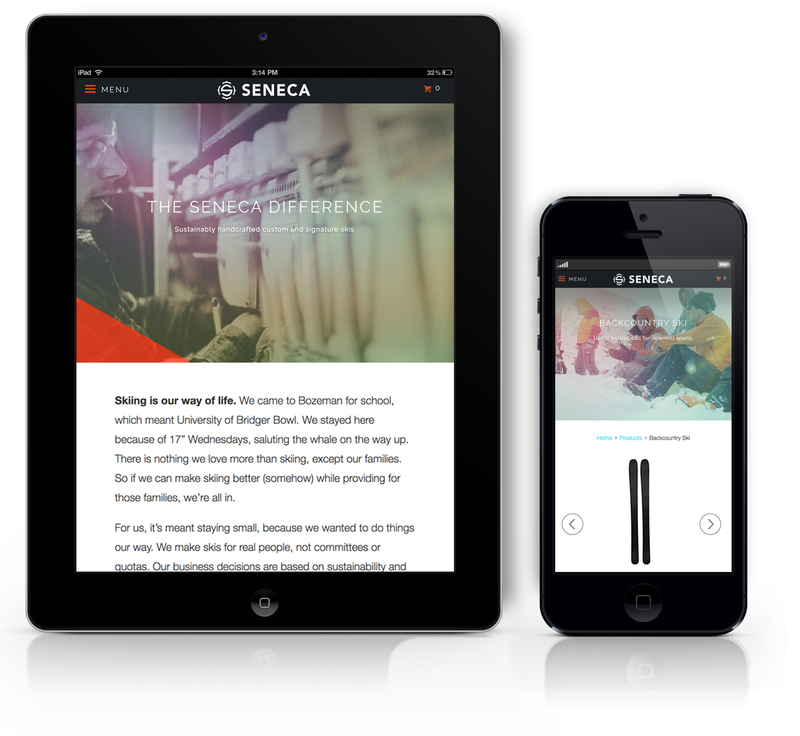 Even within just a few months of our site launch and marketing kickoff, Seneca was on track for their best season yet. Our experience with CI could not have been better. We walked in with a firm idea of what we thought we wanted. But, after Kietra (and the great team she handpicked) really dug into our company, it was clear we needed more than a website. CI put together the perfect team, helped to define and brand our company, kept us on track, and delivered on a marketing plan that was targeted, smart and true to who we are as a company.